If you are interested in going paperless, even if leadership has already decided to move forward, then the first step is to estimate the ROI of paperless manufacturing for the business. The ROI estimate not only increases support and vision upfront; it will help later to evaluate the success of the pilot program (See steps one and four, below). This blog itemizes all elements of paperless ROI, as well as areas where technological advancement has increased cost-effectiveness of going paperless, enabling smaller businesses to take large steps toward becoming Smart Manufacturers. 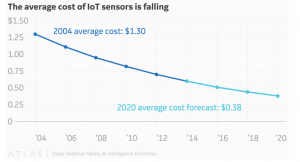 The average price of sensors has more than halved since 2004, from $1.30, and is projected to dip to $0.38 by 2020. Like sensors and barcoding, RFID prices are decreasing. Some alternatives for RFID recombine Bluetooth and barcode scanning to reach similar goals at a significantly reduced price point. Another historical but outdated deterrent to going paperless has been software, as well as the cost of integrating comprehensive solutions between the factory floor and Enterprise Resource Planning (ERP). Cloud solutions have become easier to integrate, while also allowing businesses to scale based on need and usage. On average, manual writing takes twice as long to record as digital processes, but in some cases, where sensors and other automated identification can be used, the returns can be even greater. Estimate the time it takes for employees to enter data manually and/or input manual data into databases, spreadsheets, etc. Halve this number for a rough estimate of time savings. Use average factory floor salary to convert to a financial figure. Inaccurate data can be another efficiency loss point for your organization, resulting in the need for product rework, or in the inability to make data-driven decisions. Automated workflow using RFID technology, for example, raises accuracy above 98% (Plant Engineering, May 2018). Going paperless increases accuracy and precision of tracking with real-time access to plant floor conditions. When data is instantly visible to managers, operators and MES systems, proven benefits such as improved product quality, optimized production efficiency, and supply chain integration are realized. With paperless on the plant floor, historical production data is readily available for analytics and continuous improvement initiatives. How much time and effort does it take to store and retrieve critical production records that are manually-produced? Overall Equipment Effectiveness (OEE) measures the percentage of planned production time that is truly productive, accounting for three sources of real loss. Manual tracking systems can make reporting of these three areas of loss onerous and inaccurate. Products that do not meet or exceed quality standards and therefore require rework. Production Rejects and Reduced Yield on Startup are two examples. Using digital tools to track availability, performance, and quality allows managers to understand conditions in real time and optimize performance much more effectively. Total Productive Maintenance (TPM) is a great example of an old protocol, which was onerous in 1999 but is now easier to implement. 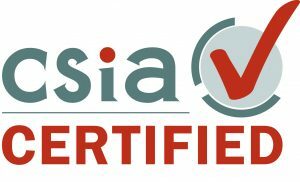 As a CSIA-Certified leader in engineering consulting and systems integration, Polytron has helped numerous global manufacturers automate outmoded data management process with digital systems to deliver real-time visibility for data-driven decisions. How far has your business come on its Smart Manufacturing journey? Take the Polytron Smart Manufacturing Maturity Checklist to find out.